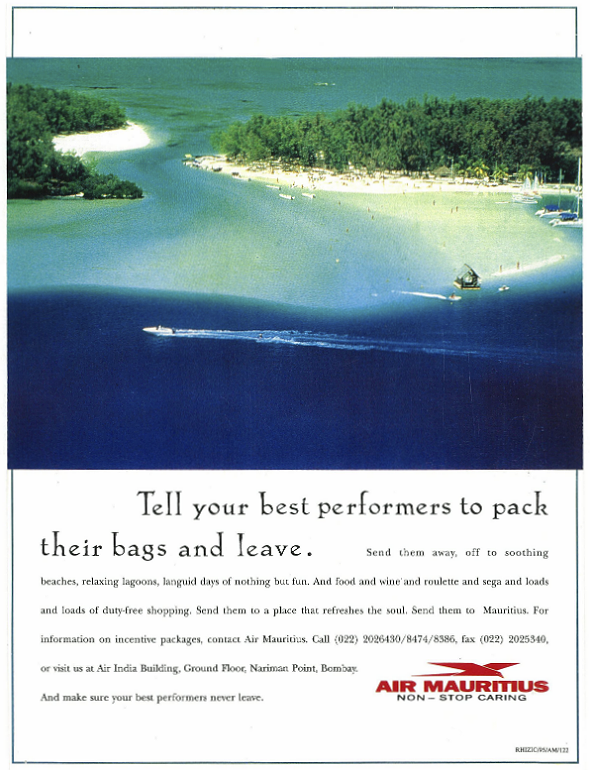 In the early to mid nineties, Mauritius started wooing Indian tourists with highly visible advertising campaigns. I was working with Rhizic Advertising in Mumbai (then still called Bombay) at the time and we handled the Air Mauritius account. These ads are part of a campaign to reach specific customer groups; such as, high spending corporate incentive package buyers and of course, the duty-free shopper. India being still not open to many imported brands, this was always attractive. Headline: Tell your best performers to pack their bags and leave. Copy: Send them away, off to soothing beeches, relaxing lagoons, languid days of nothing but fun. And food and wine and roulette and sega and loads and loads of duty-free shopping. Send them to a place that refreshes the soul. Send them to Mauritius. 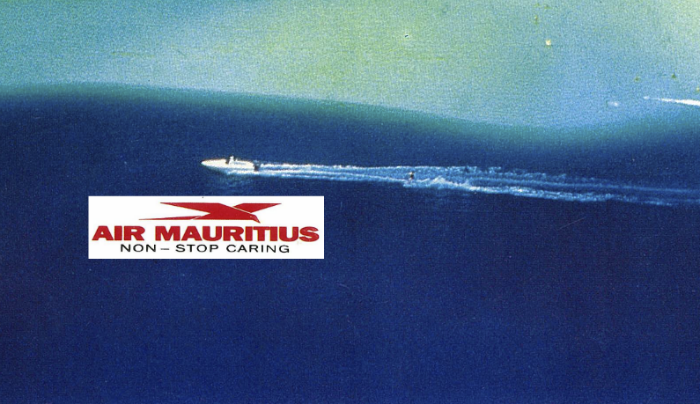 For information on incentive packages, contact Air Mauritius. Call (022) 2026430/8474/8386, fax (022) 2025340, or visit us at Air India Building, Ground Floor Nariman Point, Bombay. And make sure your best performers never leave. 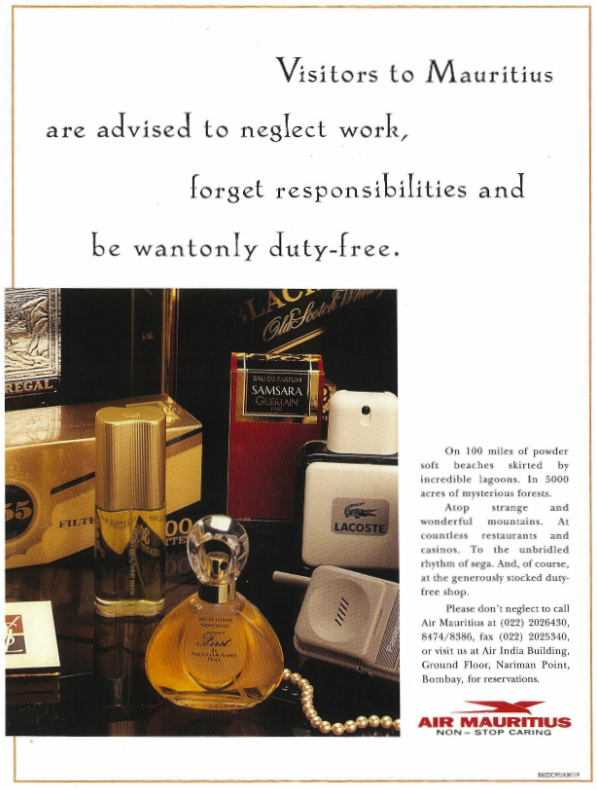 Headline: Visitors to Mauritius are advised to neglect work, forget responsibilities and be wantonly duty-free. Copy: On 100 miles of powder soft beeches skirted by incredible lagoons. In 5,000 acres of mysterious forests. Atop strange and wonderful mountains. At countless restaurants and casinos. To the unbridled rhythm of sega. And, of course, at the generously stocked duty-free shop. Please don’t neglect to call Air Mauritius at (022) 2026430/8474/8386, fax (022) 2025340, or visit us at Air India Building, Ground Floor Nariman Point, Bombay, for reservations.